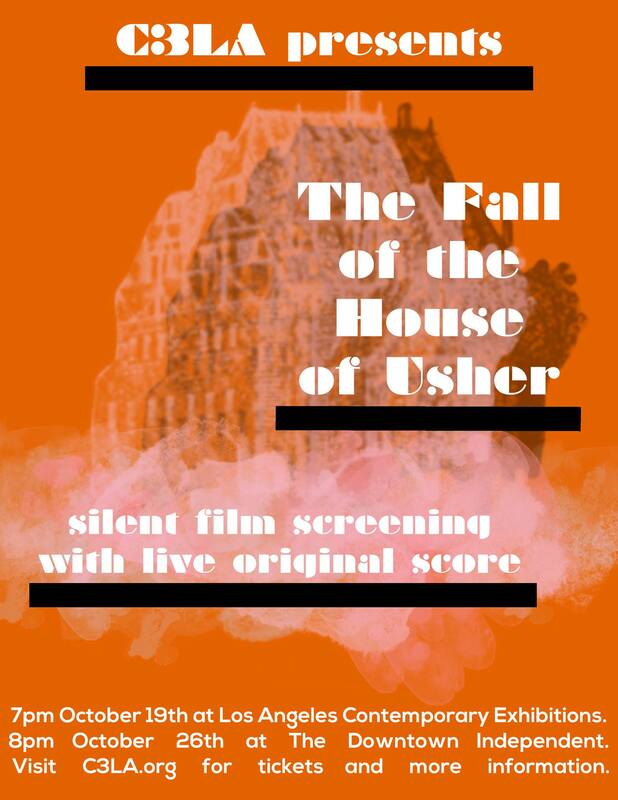 The Contemporary Choral Collective of Los Angeles (C3LA) presents their first concert series of the 2018-2019 season, THE FALL OF THE HOUSE OF USHER, a one-of-a-kind live scoring of Jean Epstein’s 1929 silent horror film, The Fall of the House of Usher, performed completely acapella by C3LA. This live scoring will feature a composite film score composed by twelve C3LA-affiliated composers, which includes scoring by Nilo Alcala, Matthew Brown, Saunder Choi, David Conley, Drew Corey, KC Daugirdis, David Harris, Allen Menton, Molly Pease, Joseph Thel, Diana Woolner, and Morgan Woolsey. THE FALL OF THE HOUSE OF USHER will be performed at Los Angeles Contemporary Exhibitions (LACE) on October 19th, 2018 at 7 PM, as well as the Downtown Independent on October 26th, 2018 at 8 PM. A reception will follow each concert.